A new friend from the West Bank sent this to me a few weeks ago. http://www.closedzone.com/ Can I,can you, fully open to the pain that is behind this video? Open to the human beings that want us to understand this message? And can I, can you, watch this without falling into blame or shame? The journey of Nonviolent Communication, of Nonviolent Thinking, is where we learn to fully face our life with open eyes, and also without blame or shame. The basic tools and consciousness that NVC offers us to be able to do this is to train ourselves to tune into and connect with the universal human needs – what is truly important to the person, truly life enhancing to the person- that we or they are meeting, or attempting to meet, by doing whatever we do. And learning to consider , to ask ourselves, what needs might not be met- our own or the other person’s- by doing what we do? Whether its in our homes, communities or between countries and peoples, Nonviolent Communication ( NVC ) invites us to take on the commitment to create solutions, to create communications, that value everyone’s needs. To create systems and agreements where no one is meeting their needs at the expense of someone else meeting their needs. How do we develop this willingness and ability to be as concerned with the other person meeting their needs, as we are with meeting our own needs? How do we develop this sense of interdependence- that, truly, my needs for safety, security, peace and freedom, are met when everyone’s needs for safety, security, peace and freedom are met, and only when everyone’s needs for safety, security, peace and freedom are met? In our NVC trainings, we explore and connect with our fear- that if we don’t take sides, if we stop judging who is right and who is wrong, who is victim and who is victimizer, who is good and who is bad,-we fear that we will be condoning a world where people’s needs are not valued, where people are not cared for, where some people’s needs are met at great, catastrophic cost to others? We look at our beliefs that compassion and caring are synonymous with taking sides; the belief that if we aren’t taking sides we are ignoring, turning our back to real harm. I myself have these fears, big time. And I feel the pull to taking sides; it often seems easier, a way to create trust and ease and harmony. A way to reveal my heart. And I equally fear that if I, if we, continue to see things through the eyes and consciousness of good/bad, right/wrong, righteous/evil, that violence will escalate, hatred will escalate, danger will escalate. We look at our fears, and the needs that we so desperately want to meet, needs that aren’t met, that are behind the fear. Then we look at the other person’s too. And we see if we can find new strategies or solutions to address each person’s fears and the needs behind them. Because our world is so starved for compassion, people are usually saying,”please listen to me, please help me, please see me, please value me.” If I habituate myself to listening for the “please”; if I incline myself, my consciousness, to hear the “please” in difficult messages, I bring myself into connection with what is in the other person’s heart. Nonviolent Communication is when we value creating this connection to the other person’s heart above “getting our own way”; above fixing, instructing, educating or correcting the other person. And we don’t advocate giving up on what you want- not at all- its just that until I hear the “please”; until I understand what the other person wants me to understand about their experience of what’s going on- until I hear that, connect with it, really get it, there isn’t much hope of them ever opening to hear and care about what is important to me. Instead, I can choose to focus on creating connection, heart to heart; and I am willing to go first. So with Nonviolent Communication, we want to learn how to listen to what is in the other person’s heart and also how to speak from our own hearts. Hearing “please” Behind the Wall A few hours into the Bethlehem training, I asked the class if they were willing to guess the “please” in the hearts of the Israelis who support the wall. We used the NVC Needs list to support our inquiry. These Palestinian women, who had spent the first hours of the class speaking about their own painful longing for peace, security, safety for their families, guessed right away that peace, safety, security and trust were some of the needs that the Wall may be meeting. When I explained that the vision of NVC is to create solutions that will meet everyone’s needs for peace, safety, security and trust, they wanted to know how. of course; this isn’t theoretical. This is life and death here. 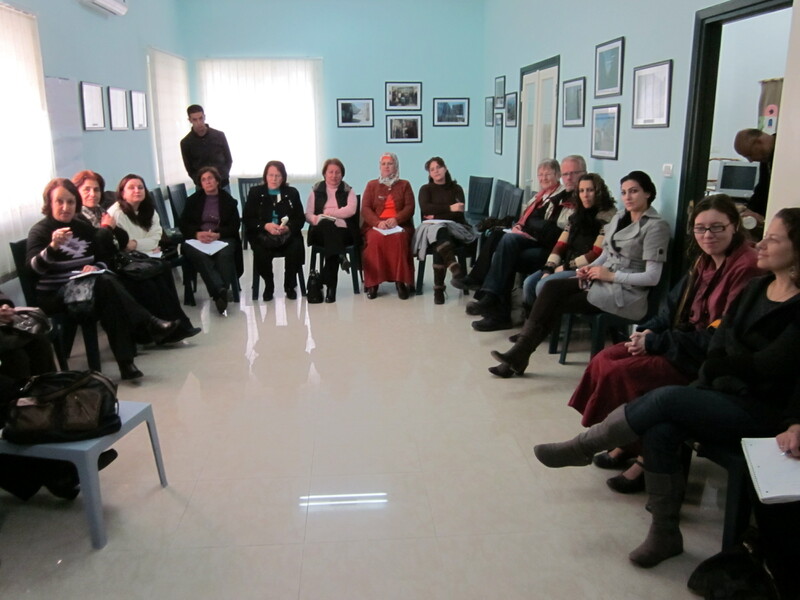 This led to a discussion of strategies including people to people dialogue between Israelis and Palestinians. Some participants are eager for this; others feel wary, not wanting to talk when they feel so discouraged and without trust. Wanting a change in the power structures first. I suggested that NVC can help us discover new strategies that haven’t even been thought of before. I suggested we try out the process in our own daily lives- in our families and communities- what happens when you listen deeply for the other person’s needs; when you connect with their needs because they are universal, familiar to you, you know how essential they are to life. and when you get clear about your own needs, and feel determined to get them met too- what happens when you value each side’s needs equally? Will creative new solutions arise? As we discussed this there were excited offerings of various strategies to meet the needs. I also heard feelings of suspicion, the breakdown of trust between Israelis and Palestinians is so huge- is the Wall really to meet these needs? Isn’t it a land grab? It can’t be about those needs because anyone can get through. 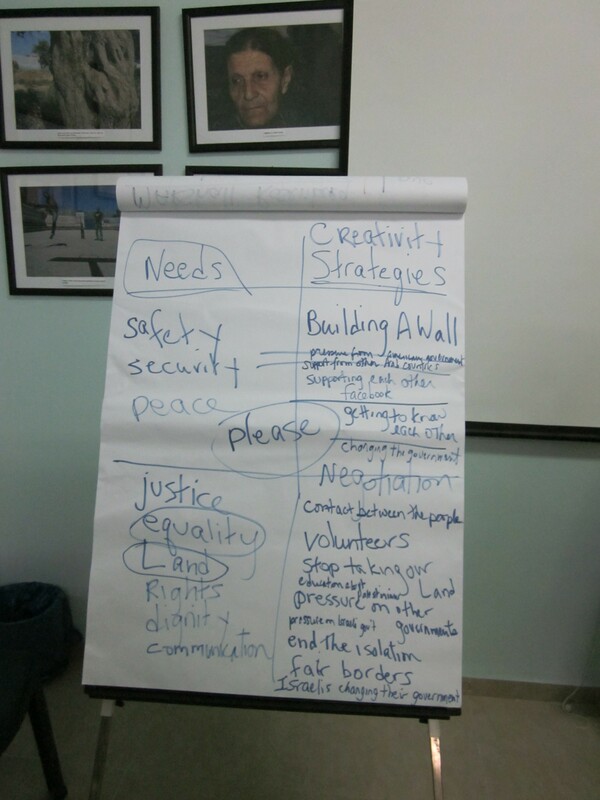 We explored how often the strategies we adopt to meet needs- for example building a wall to create safety- often aren’t successful strategies; often our strategies come out of our fear and mistrust; they don’t look deeply at how the other person’s needs are affected, so certainly in the long run, if not all along, they backfire. In this discussion, I witnessed how the attention on needs that NVC brings into the political discourse supports finding solutions that everyone can support. There was skepticism in the room that safety and security were why people supported it. I asked, if the Wall hasn’t stopped the suicide bombings and other attacks, what has? What is it that has met the need for ending the violence and creating safety for the time being? I was able to focus on that question because I kept my awareness on the need for safety. When we all focused on the need, even those who didn’t necessarily believe that was the reason for the Wall, we could see that the more we focus on the needs, beyond the strategy, the more hope and possibility there is for creating new solutions for everyone. We also talked about honestly looking at the “cost” of our strategies- if my strategy- in this case building the Wall or other features of the military occupation of Bethlehem and Palestine- is at the expense of other people meeting their needs, will I really get the peace and security I want? What about my own values of life and compassion and humanity? 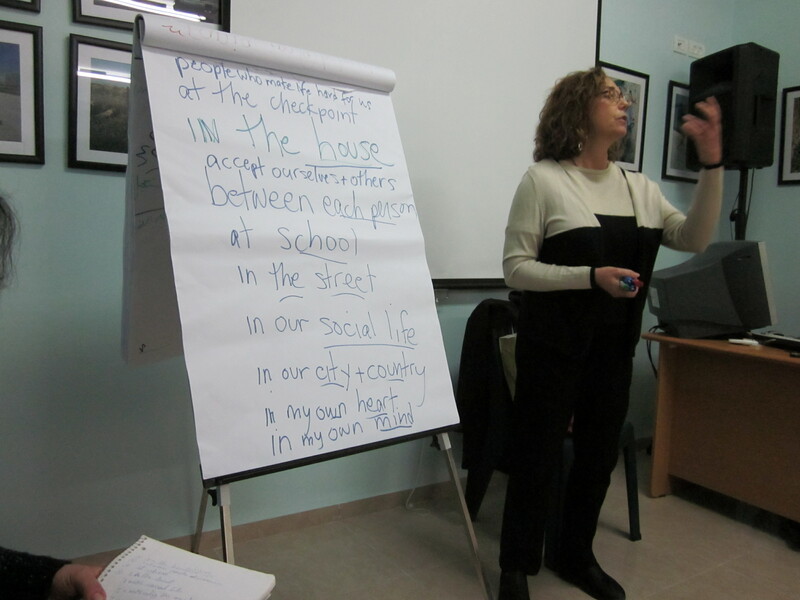 These are the questions we ask when we bring Nonviolent Communication to the issues in the Mideast. I went to Hebron with the Encounter Leadership Program, holding for myself a strong intention to see, to hear, to connect, with whatever suffering I encountered- from Palestinians or Jews, both of whom are living in the military zone that is this ancient holy city. I went to engage without blame. I trust that somehow being present in this way makes a difference in the world. As usual, I am humbled by what I discovered about myself. 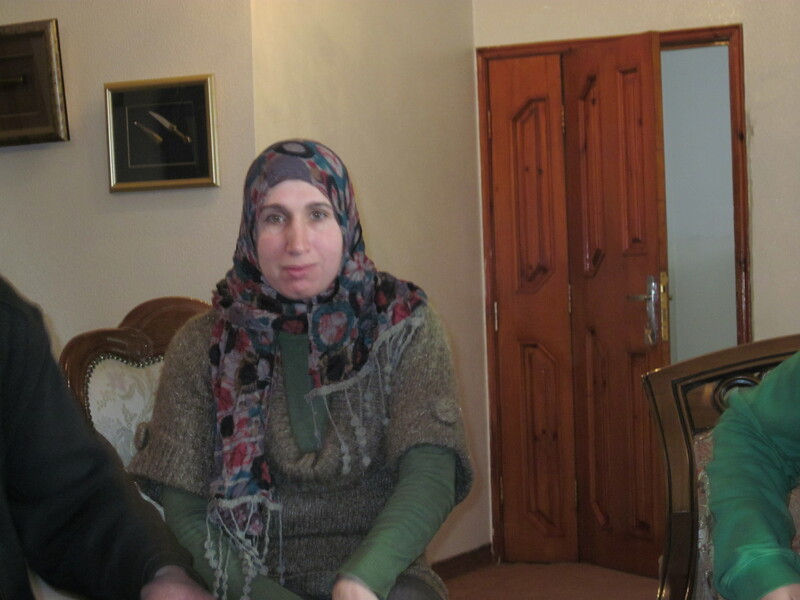 In the afternoon, our group was welcomed into the home of the Ahmad family. 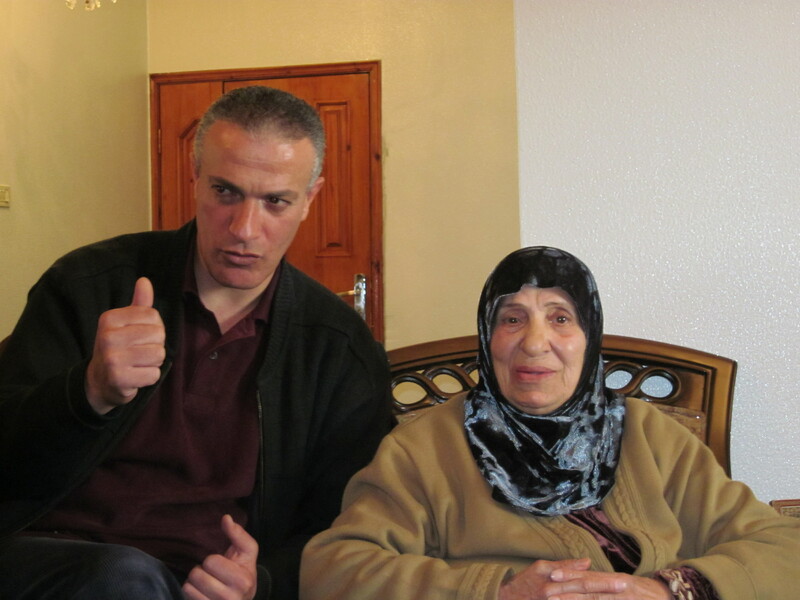 We met “grannie,” the 89 year old matriarch who left Turkey as a young woman to marry the son of Abraham Ahmad of Hebron. Today, she lives in traditional Arab style, with four generations in this large multi apartment family house, with the family auto parts business on the ground floor. Grandson Yousef’s wife served us a continual flow of delicious lightly sweetened minty tea and cardamom flavored coffee and an assortment of fabulous pastries with prune filling , one a basic Hamentashen in different shapes. Our Jewish delegation wanted to know about the 1929 massacre of Jews in Hebron and what their ancestor Abraham had done; Abraham Ahmad is celebrating for saving dozens of Jews and escorting them to Jerusalem. The massacre of 1929, as it is known in Jewish history, is very much alive in the minds of Jews as they wrestle with creating solutions to the situation today. Our delegation- not one of us born near 1929- wanted to know how important the story of Abraham’s actions is to their family. We wanted to know what it meant to their family. I began to wonder, what is it, really, that we want to know? We want to know if our narrative, the narrative of the Jewish people, touches them, affects them, and has been taken into their hearts so deeply that truly we can trust this relationship. We wanted trust. We want our fears to be understood. We want our fears to count. We asked Yousef- himself a father and businessman who shared experiences he has- positive ones- with Jews in nearby settlements- , how often do you go to pray there? He replied softly, not so often. We asked when did you go last. He said, well, of course on the holy days. Why not more often? On and on we pressed. Well, his voice became softer and softer, and he said, my father was there when it happened. When it happened? He bent over ever so slightly, into the position of Moslem prayer, my father was praying with his friends in 1998 when Baruch Goldstein came in and machine gunned down of them. So it is scary for me to go there. I don’t feel safe. I felt my heart drop as I realized that the 1929 massacre was more alive for me than the 1994 massacre where his father had been. I remembered at that moment that we passed the grave of Baruch Goldstein when we drove beyond the checkpoints to get to the house. Only here in Yousef’s house did I begin to imagine putting myself into the shoes of the Palestinians who see the grave and see people honoring the grave. The fear that is alive. I learned how easy it is for me to forget to stand in other people’s shoes; how my own strong identity as a Jew can lead me to not fully take in other people’s suffering. I learned how much I yearn to connect deeply with my Jewish roots and practices, and also to honor, respect, value and understand our Moslem cousins.